First, let me define diet as simply the food one eats. Your diet is what you eat at a meal, over the course of a day, and more so over the course of your lifetime. Diets change with the seasons (especially if you eat local food) and with our moods. Now I realize that most people quickly think "weight loss" when they hear the word diet. If I mean weight loss, I will specifically term this a weight loss diet. Many of us have tried different eating styles in the quest for better health, vibrant energy, balanced body weight, etc. : raw food, vegan, vegetarian, omnivore, carnivore (I am thinking a serious Dr. Atkin's diet here! ), local, seasonal, gluten free, wheat free, juice fast, herbal tea fast, and on and on the quest goes to get it right. I am feeling a frisky need to share the things I have tried, how they worked, why I changed the "diet" yet again, and all the funny tales that accompany my food adventures. I have to laugh as it is all a learning journey, a trek through the food of my neighborhood and the world! I offer up this information with humor and love. I think I am suffering from Cabin Fever and a serious desire to move into the Spring Fever mode! Spring Fever Crocus flowers, 2014 at the Potsdam Food Coop... they want out of their winter "cabin" too! Framed photos compliments of Jayne at the Potsdam Food Coop. I first veered from the diet I ate growing up after reading Diet for a New America by John Robbins when I was 26, maybe 27 years old. I then decided eating vegetarian was the life for me. This vegetarian eating quickly evolved into vegan eating; if I wasn't going to eat the actual animal because of the horrid way they are factory farm raised, I could not see me continuing to eat their products (milk, dairy products, and eggs) as being any different. This plant based diet of mine went on for 7 or so years. I had fun learning about all kinds of "new" veggies and beans that I had not been exposed to as a kid. You know, in walks the kale and collards and the broccoli not slathered in cheese sauce. Who Knew! Broccoli comes without cheese sauce? This diet is the how, when, what, where, and why of my learning to cook and eat seasonal veggies in amazing ways. Along this part of my diet trek I tried macrobiotic, Ayurvedic, and various other ethnic, plant based diets. What a fantastic way to learn spices, herbs, and food combinations that I was not exposed to in the meat, potato, and side salad and/or cooked veggie diet of my youth (Now trust me, I am not knocking my diet of childhood and young adulthood. Read on and you will see why.). I was 33 when I experienced my first pregnancy. Along with pregnancy came dreams... dreams of Mom's roast beef dinners (yup, the meat and potato thing was back with me! ), chicken and dumplings, venison stew, and various other omnivorous - carnivorous things my Mom whipped up in splendor. I wanted meat. My Dad, being the wise man he is said this: "Obviously your body is telling you something, get down here for dinner, your Mom is making you venison stew." So I did! The road from Hannawa Falls to Brasher Falls is not a long one when Mom's venison stew is at the journey's end! I continued to eat meat here and there throughout this pregnancy and mostly squelched my body's cry for protein with lots of free-range eggs and organic cheeses. Keep in mind; I ate a very healthy, whole food and plenty of protein foods vegetarian diet. No junk, no refined, no packaged vegetarian fake food products... just lots of veggies and beans and whole grains (pre-soaked and cooked in a thermos, I did it up right!). My only question from these vegan years: How did I survive without butter? If I was going to eat a vegetarian only diet again; and believe me, I eat plenty of vegetarian and vegan meals, I would do some things differently to prevent weight gain (more about this later). I would eat my beans coupled with lots of yummy, raw nuts and seeds, skip the grains most of the time, pile on the veggies, and enjoy fruits in moderation. Veggies, veggies, and more veggies. Many ways to whip up veggies and enjoy without cook books or recipes: how to spice them, how to blend them with other foods, how to enjoy then in ways never before! Balanced diet for me: I tend to be better satiated with a leaning towards protein and fat and I maintain my healthy weight this way. Pregnancy, post pregnancy, and breast-feeding found me searching out local sources of grass fed meat / dairy and pasture raised eggs. I was an omnivore again! To my delight, the 15 to 20 pounds I had gained eating a mostly vegan diet literally melted off my body without any effort. I say mostly vegan diet as on occasion I would eat pizza with cheese: whole grain crust pizza loaded with yummy veggies and organic cheese! Over the years of vegetarian and vegan eating... let me tell you the fun and funny diets I tried to lose this gained weight. Yup, now I am venturing into the "weight loss" diet realm. Now keep in mind, this was all pre-motherhood and I had plenty of time to mess around in the kitchen and the health food store learning and trying new things, prepping food, and making fresh juices and herbal teas. Post-kids... I just have to have food ready to eat! I was always mystified as to why I was gaining weight on a vegetarian diet. It made no sense to me; I was eating a healthy, whole food, and animal fat free diet. Why was I getting fat when I was leaving the animals to keep their own fat alive and intact on their body frames? In retrospect, it was all in the grains, too many grains for my body. This is where the knowledge that not one diet is healthy for every human on the planet comes into play. We must consider our physiological make up, where we live, the climate, etc. In come the herbal tea and juice fasts. I figured I could wash that fat right out of my flesh, re-set the metabolism, clean things up a bit, and get a fresh start on life and eating. I would eat raw foods for a day, drink nothing but fresh juices and herbal teas for 3 to 7 days or so, another day of raw foods, and then back to my vegan diet. My weight loss on these fun food frolics away from solid food? Big fat zero. Never worked! But I did these juicy, herbal fasts over and over. Now I confess it was fun and easy. The food prep was minimal and the clean up a snap. No prepping, chopping, and cooking food. Just a simple zip the veggies down the juicer tube and voila'... my meal was ready! I loved carrot, celery, and beet juice. Yummy! The best combinations of fruits and veggies in juice blends. Juices are easy "to go" meals. The body feels so good when it is emptied of food for a few days. Warning: While this form of liquid detox diet was fun in the moment (much fun), I have to warn you that its cellular enhancing properties are not recommended over the long haul of one's life. : ) And, for your information, the J. D. is not a juice related thing! If you are wondering: "What? Paula on a beer diet?" Yes, in my 30 plus years of studying and living holistic health and healing... I have not been perfect. There, I confessed my food and beer style sins. One can survive several days on beer. The colon is completely cleansed out after a weekend of beer fasting. This type of fasting works more efficiently and pleasantly at younger ages. My "taste" in beer has grown up a bit. I miss my sisterly fun! Eating macrobiotic is recommended to heal the body of cancer and many other health concerns. Obviously I needed to look into this healing diet! (I was probably 28, maybe 29.) I read up on it, attended a couple of classes, and joined a weekly dinner group. Both the classes and dinner were through a group in Syracuse, NY called Wellspring. The foods I was introduced to were amazing: pickled stuff, fermented this and that, sea weeds (on a more palatable note, sea vegetables), spices I had never heard of, many rice varieties, and on and on. This was the start of my "local" food mentality. Pure macrobiotic, when you get to the heart of the teachings, is truly about eating the local foods, what is available locally and seasonally close to your home. This made so much more sense than me, a basically French decent person, eating foods local to the country of Japan. Seemed silly transporting Japanese foods to my plate in Northern NY State. Ayurvedic healing is a system where your specific healing and eating plan is based upon your constitution, your body type. What you eat is based upon the needs of your body: hot, dry, cold, wet, etc. 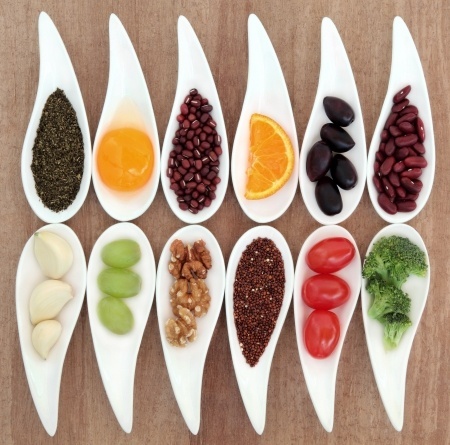 and the 6 tastes in food to balance your specific body's needs, appetite, satiation, and taste buds. I am giving a very over simplified definition of this healing lifestyle. As per one practitioner: The most important principle in the Ayurvedic Diet is that your food is fresh (without pesticides, additives, and other chemicals), seasonal, and as often as possible local. Fresh doesn't, however, mean raw. The best Ayruvedic meals are freshly cooked, whole meals. Are you seeing a pattern in my learning through diet, dieting (not weight loss but simply eating plan) through learning? Again, it is the local and seasonal thing coming at me. All these ethnic cuisines I played around with just drove home the point that our food needs to be as fresh as possible which means local and seasonal food... not food shipped in from hundreds and thousands of miles away! Well, except for beer, of course (It is that beer thing again. But no more all weekend beer fasts for me. I am not certain a 50 year old body can handle that lifestyle!). I do buy wheat free beer (so I avoid the biggest issue around gluten, modern wheat), organic, and brewed in Europe. I figure European beer has a better chance of being free of GMOs and other unhealthy stuff. My psoriasis, digestive woes, and joint pains disappear when I leave wheat alone. Gluten Free beer is nasty. I assume that European brewed, Belgian style ales are made with non-GMO barley and hops. The gluten in barley is a totally different thing than the gluten in modern wheat. Belgian style ale is yummy. Have I mentioned this before? I am certain I could tell many more tales, if I thought on it long and hard enough, about all the fun food diets I have tried, the foods and spices, and the cooking methods. Life is a journey; food is a journey... just make sure to have some good quality beer and butter (from grass-fed cows) along for the trek! SHARE: Tell us your healing diet stories in the comments below. *Super-Gluten: I use this term as a blanket word for wheat that has had the percentage of gluten in it changed horribly and in the cross breeding of wheat to arrive at modern wheat, we have created gluten proteins that have never existed before in heritage wheat.